HGTV.com has teaming up with Travel Channel & Food Network to brings you the Find More Texas Sweepstakes where they will be awarding Round-Trip coach air for winner and one guest, Three days/two nights first class hotel accommodations plus spending cash and more of winner’s choice. 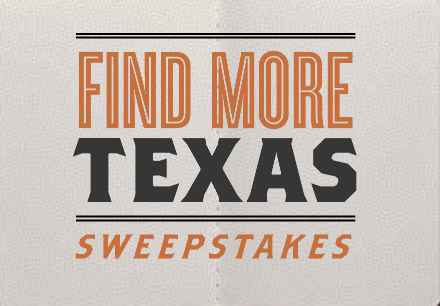 How To Enter The Find More Texas Sweepstakes? During the sweepstakes period you may enter the sweepstakes by visiting HGTV’s website (www.hgtv.com/findmoretexassweepstakes), by visiting the Food Network website (www.foodnetwork.com/findmoretexassweepstakes) or by visiting the Travel Channel website (www.travelchannel.com/findmoretexassweepstakes) after visiting the sweepstakes page by one of these methods now follow the online instructions to register by entering all information requested on the registration form. Incorrect and incomplete entries are void. Who Can Enter: This sweepstakes is open only to legal residents of the forty eight(48) United States and the District of Columbia (excluding Texas)) who are twenty one (21) years of age or older at the time they enter the sweepstakes. Sponsor: Scripps Networks, LLC, 9721 Sherrill Boulevard, Knoxville, Tennessee 37932. Sweepstakes Prize: The Grand Prize Winner will receive their choice of one of the following vacation packages (the “Grand Prize”): (i) a trip for two (2) to Austin, Texas; (ii) a trip for two (2) to Dallas, Texas; or (iii) a trip for two (2) to Houston, Texas.